Vega Strategic Services: Russian PMCs As Part Of Information Warfare? The Russian investigative agency Conflict Intelligence Team (CIT) published a report, on March 28, stating that, in addition to private military armies, Russia has now created a Private Military Company (PMC) of a new type. Specifically, the report examines Vega Strategic Services Ltd. (Vega), “a Russo-Ukrainian ‘classical’ PMC,” which is currently operating in Syria and supporting President Bashar al-Assad. 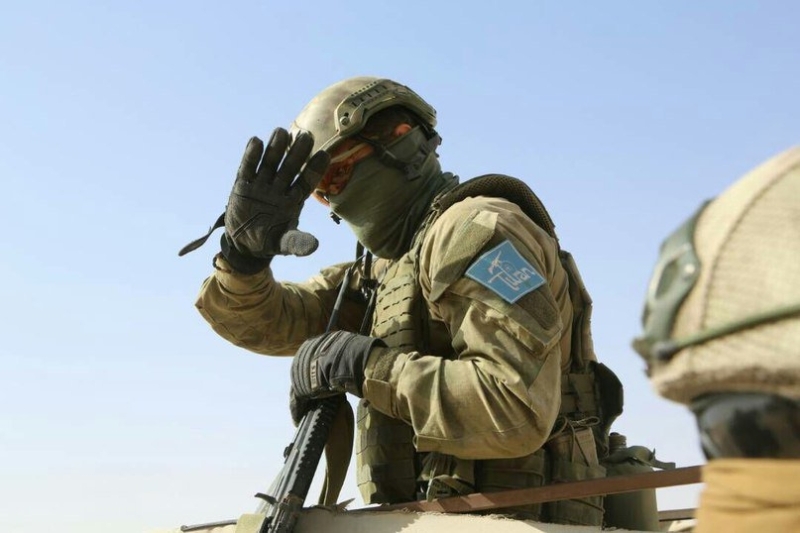 As noted in the report, “unlike ‘PMC Wagner,’ [Vega] does not conduct formal military operations; its prime goal is concerned with training local forces, as well as protection of various objects—akin to missions carried out by Western PMCs… Given the close ties between the Liwa al-Quds militia and Russian forces in Syria, one could argue that Vega is acting with the permission of Russian authorities” (Citeam.org, March 28). Liwa al-Quds (a.k.a. the Jerusalem Brigade) is a predominantly Palestinian militia and fights as part of pro-Syrian government forces in the Syrian Civil War. The investigative report relies on three main sources of information. First, it refers to former ANNA News correspondent Oleg Blokhin, who posted images of instructors from Vega in Syria, where they were evidently training Liwa al-Quds fighters. The second source behind the CIT report is a comprehensive profile of two members of Vega, both of whom are Ukrainian citizens. Anatoly Smolin, one of the alleged founders of this PMC, upon his retirement from the Soviet KGB, pursued a career in the Ukrainian Ministry of Internal Affairs. In 1997, he subsequently switched to rendering private security services. In 2004, Smolin founded the security companies Alfa-Shchit and Kolchuga; while, in 2011, he organized Vega Strategic Services. Images retrieved by CIT, appear to show Smolin training Liwa al-Quds militants in Syria. The other profile presented is of Dmitry Dzhinikashvili, who, according to the report, was not only employed by Vega between 2012 and 2014, but also briefly served with Slavonic Corps Limited, a short-lived Russian PMC organized by former members of Moran Security Group Vadim Gusev and Evgeny Sidorov. Slavonic Corps was destroyed in Syria in 2013. Investigators linked Dzinikashvili’s alleged presence in Syria with a photo from Palmira posted on the online social media network Vkontakte. The third element of the CIT report’s investigation is based on an interview with Andrey Kebkalo, one of the founders of the Omega Consulting Group PMC, which has reportedly opened a branch in Burkina Faso (Africa’s fourth-largest gold producer) (see EDM, October 17, 2018). In the interview, Kebkalo acknowledged his role in creating Vega and corroborated the Smolin’s role in this PMC. The report sparked an immediate and extremely harsh reaction from the Security Service of Ukraine (SSU). In his comment, SSU head Vasyl Hrytsak stated, “Members of the terrorist syndicate of the Russian special services under the name ‘PMC Wagner’ have no citizenship. For the past several years, the SSU has brought to light hundreds of mercenaries of this detachment of [i.e., backed by] the Directorate of the General Staff of the Russian Armed Forces (GU) [Russian military intelligence, still frequently referred to by its former acronym GRU], among which are people from Ukraine, Belarus, Moldova, Kazakhstan, Serbia and other countries. The only thing that unites them is a readiness to kill anyone and in any spot in the world at the Kremlin’s order and for its money. No Russian fakes can hide this truth from the world.” The SSU press service has corroborated the fact that Smolin and Dzhinikashvili are indeed Ukrainian citizens, who, however, left the country after 2014, and started to actively cooperate with Russian military intelligence and other special services. The SSU also confirmed that Vega, although created by Smolin in 2011, was not engaged in rendering private security services. In its final analysis, the SSU called the report produced by CIT “fake news,” stating that “it is still the Wagner Group that trains pro-Assad forces” (Ssu.gov.ua, March 28). In his response, CIT’s chief investigator, Ruslan Leviev, expressed his surprise at the SSU’s reaction, and criticized it for an “unprofessional approach.” He also pointed out that Vega is by no means a joint (Russo-Ukrainian) initiative, as was asserted by the SSU. In a related comment, Leviev stated that, “when we are talking about a Russo-Ukrainian PMC, we do not mean to say that it was created or formed with participation of Ukrainian state authorities. We are saying that it was organized by Ukrainian citizens, and it was positioned as a Ukrainian PMC from the very beginning… It does not mean that it is a joint project of these two states, it is merely a private business” (Currenttime.tv, March 29). The SSU’s and CIT’s competing narratives notwithstanding, some aspects pertaining to Vega are indeed rather confusing. For instance, it is not at all evident why openly pro-Kremlin Russian media outlets have been allocating so much attention to this particular PMC, while other enterprises of this type (the Wagner Group or Patriot, for example) have remained taboo in the Russian press. Specifically, an article entitled “Damascus is Hosting the 60th International Exhibition of Industrial Goods,” published last year in Federalnoye Agentstvo Novostey (Riafan.ru), reports, “the Russian side has actively participated during the forum. Namely, one could see Vega Strategic Services Ltd., which was created in 2012, in Cyprus, by veterans and former members of special maritime, army and police formations from Ukraine, Russia and Greece” (Riafan.ru, July 30, 2018). Particular attention should focus on the source of publication: Federalnoye Agentstvo Novostey is a Moscow-backed information outlet closely related to the notorious St. Petersburg–based “Troll Factory” financed by Yevgeny Prigozhin (a.k.a. Vladimir Putin’s “Chef”). Another ultra-conservative anti-Western information outlet, Tsargrad TV (belonging to the “Orthodox oligarch” Konstantin Malofeev, who has been sanctioned by the European Commission for financing separatism in Ukraine) also released a complimentary article that confirms the previous information (Tsargrad.tv, February 9, 2019). Commenting on these developments, Yevgeny Shabaev, the ataman (head) of the Khovrino Cossack community, stated that he is familiar with Vega as a company with limited resources and hardly commensurate with the tasks frequently performed by Russian military contractors. He added that the whole story with Vega is nothing but an example of a counter-information operation (counter-propaganda) carried out by information outlets close to the Kremlin. This counter-propaganda campaign, Shabaev argued, seeks to discredit other media outlets covering the Wagner Group (Rtvi.com, February 12).